Country music is fun to play. The songs often contain elements of folk, rock, and blues. The lyrics are typically rich in story. This makes playing country music fun for everybody from straight country musicians to guitar players who simply enjoy getting into the groove of something else. Finding easy country guitar tabs to play isn’t difficult. There are a lot of guitar tab websites that feature easy guitar tabs for country songs. In fact, a lot of country songs are fairly easy the way they’re written, so a lot of them can be played by beginners without an easy version. Here’s a contemporary classic by Toby Keith called “Wanna Talk About Me.” This is a slightly easier arrangement of the song that shows both standard and tab notation. 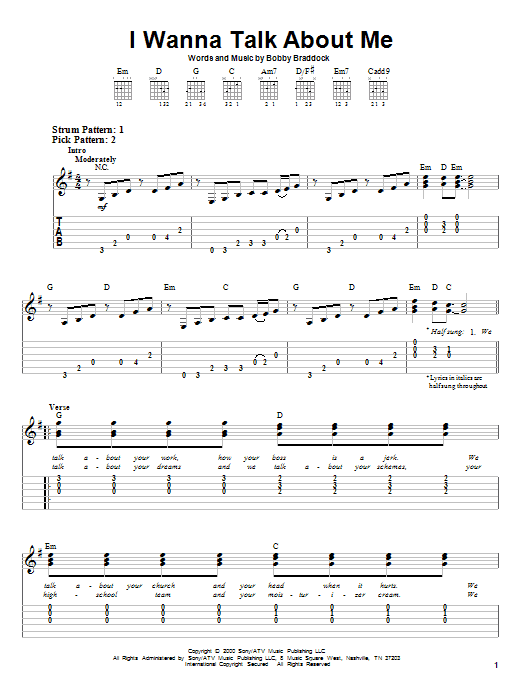 There are guitar tab websites that offer arrangements like this, aimed at beginning guitarists. 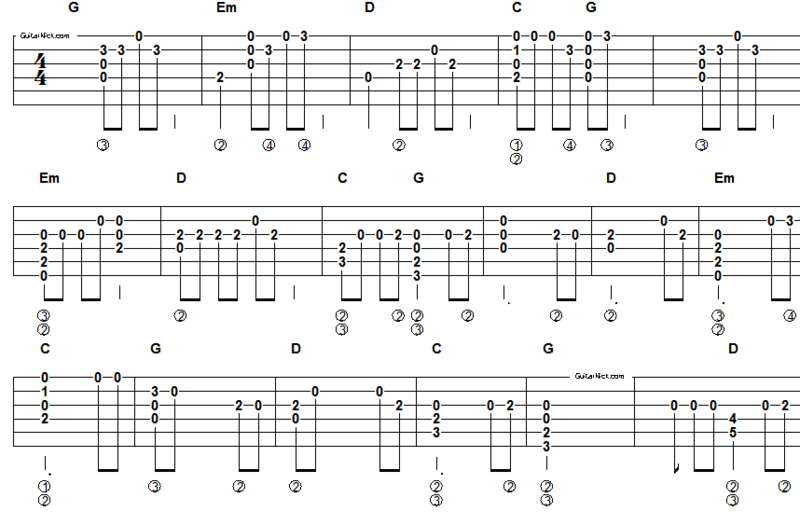 If you’d rather play something a little more standard, you can find easy country guitar tabs like this fingerstyle arrangement of the John Denver classic “Country Roads” laid out in strict tablature. If you want to beef up simple arrangements by learning guitar licks and fills to add some color, you can take advantage of free country guitar tab licks like this example in the key of D. This is a typical country guitar lick you can use (changing keys when needed) to fatten some of your simple arrangements. Of course, if you would rather improvise, you can find chord/lyric charts for most country songs and use them as a foundation. A chord/lyric chart is pretty simple. The lyrics of a song are presented with the appropriate chords placed over the words to indicate chord changes. Most country guitar songs sound good when you play them by singing and strumming along with the chords. If you’ve got a good ear, you can use lyric chord charts for the basic structure of a song and then add some improvised licks to fatten up the sound. If you’ve developed a good repertoire of standard country guitar licks, you won’t have any trouble putting together easy arrangements of some of your favorite country guitar songs. You might even find it easier to sit down and listen to the country songs you like, then creating easy country guitar tabs yourself. Either way, playing country guitar is fun and a lot of the tabs available for free are easy to play and can be found all over the Internet.